Blaming science for the world's ills is akin to blaming guns for war. It is NOT the tool, it is the intention behind its wielder. Senses... personally, I am an open-minded pragmatist. While 'super-natural' experiences have been had, I ALWAYS look for an explanation, if nothing more than to play Devil's advocate. Most times, I CAN find an explanation, or at least a possibility. What we call science today, earlier humans would have called 'supernatural' simply because it is beyond their comprehension. For example: I agree 100% with Simon's reasonings for 'disappearing bigfoots'... ie; possible use of infrasound combined with 'cloaking' via a natural ghillie suit. However, in saying that I DO remain open to the possibility of 'portals' simply because of what I have read in Louis L'Amour novels (explained in another thread in this section of the forum). When someone comes on this forum saying they are seeing portals, Yowies transmogrifying into bush turkeys and 'Yowie Modern Art', I remain open to ALL possibilities. But then when they post pictures claiming said portals to be there in plain view yet all I see is NATURAL bush, I will state my opinion on what I see. If what I say (or others) 'insults' someone and 'forces' them to leave this site, they have their own issues of immaturity to deal with and hence are not my problem. While I am very sensitive to whatever state of mind others may be in I will NEVER play nursemaid to their feelings with 'Political Correctness' by lying or ignoring said issues. To do so is not only disingenuous, it is damaging to what is already a 'taboo' subject studied only by 'freaks' and 'nuts' (in the eyes of Joe Public). FFS whatever happened to 'Sticks and stones may break my bones but words can never hurt me."? This society has lost its balls. There are no MEN left, only children in adult suits... which DOES explain how our government/law/education, etc has been taken over. THAT is the reason we and this planet are screwed, NOT 'science'. Today 'Evil' rules the planet because there are no Men left to stand up to it. Everybody is too scared to offend, and ironically be 'called names' themselves. Our Ancestors, 'Founding Fathers', etc would be ashamed of us. [quote="Wolf"]Blaming science for the world's ills is akin to blaming guns for war. Wolf,my point exactly but much better put. .
As far as these people seeing portals, invisible yowies, shapeshifting etc, really who are we to say they have or not. We can ignore it if doesnt fit with our beliefs or bigfoot blog or researchers we follow or even our own internal b.s meter but doesnt mean we are right as none of us know the real truth unless we see for themselves. If people are going to get upset then they shouldnt share the experience but no one can tell them they havent as we dont know. In saying that i dont blame anyone for not sharing as its pointless really. This is not some fringe subject either (imo).ThIs could be one of the most important subjects and possible (re) discovery in modern history. Wolf wrote: Blaming science for the world's ills is akin to blaming guns for war.
. Senses... personally, I am an open-minded pragmatist. While 'super-natural' experiences have been had, I ALWAYS look for an explanation, if nothing more than to play Devil's advocate. If downloading an AYH video on my mobile and getting a static/crackling background noise with deep mumbling voices and no visual of the video I am of no doubt that was an unexplainable supernatural experience or having a whole page of comment on the Nephilim hybrid Dieties of Ancient Egypt erased word by word as well as research material removed from saved documents absolutely a supernatural experience. I heeded the warning and would not comment further. That is why I believe my explications of Yowie/Bigfoot/Dogman are very possibly much closer to reality than most. Wolf wrote: This society has lost its balls. There are no MEN left, only children in adult suits... which DOES explain how our government/law/education, etc has been taken over. This part of your rant I like, its true political correctness has and is going mad, that's because there has been an effort to break downs spiritual laws that have been in place for thousand of years. In today's society you cant say anything without being labeled something. All this gender neutrality business being on an even playing field BS is destroying life as we know it, but hey I'll probably be called or labeled something on that. I feel sorry for the younger generation that has to go through life feeling as though they cant speak up because someone might be offended. ... personally, I believe it to be so in order to keep the masses subdued so the psychopaths can keep running the asylum. Indeed various white papers and writings by the likes of Edward Bernaisse, Huxley and others indicates it is all intentional. Searcher might say it is an evil force, satanic perhaps, that steers the ship at the moment. which is why Dogmen, etc are being released? Hmmm. That doesn't sound like something that Searcher would say. I think you mean Senses? True what you are saying about the masses. We are just born consumers these days. Willing slaves to technology unfortunately. And so are you Dion. I would be labelled generally as a conspiracist whako and I would proudly wear the crown. I believe a plan was set decades ago to dumb down society to the point they no longer can make measured decisions. Political correctness, marriage equality, the emasculation of males by the feminazis still very prevalent in Movies, TV shows where males are subordinated by females. the feminising of males (remember when the term sensitive new age guy came about back in the 90's). I believe political correctness is the terrorism of the West. Hmmm. That doesn't sound like something that Searcher would say. I think you mean Senses? [Unquote]. I sometimes get the feeling that people would like to add non to the senses part but hold back because of politeness. Disagreeing with someone and then being able to outline your opinion with a reasoned argument is an essential aspect of democracy. I think some people just want us to shut up and agree with them, which displays a fundamental lack of understanding about what constitutes a reasoned discourse and an inability to actually outline a coherent argument beyond saying "this is good and this is bad". That isn't a discussion, it's a statement. Ha. My Dad would have said ALL religion is nonsense. ... "Philosophy is questions you may not answer. Religion is answers you may not question." You too, are spot on. It is in 'their' writings. Men have been mentally emasculated via careful programming. Why do you think they call TV programs 'programs'. And for some years 'they' have been in control of our education systems as well. Instead of bumbling about trying to comprehend the origins of Bigfoot/Yowie why not listen to people's eyewitness accounts of their experiences with Bigfoot. Not only an eyewitness account but hands on experiences with these creatures. These reports come out of the United States though we do have reports in Australia regarding Yowies but these tend to be dismissed especially if there is a paranormal aspect involved. This is a Brenton Sawin video: https://www.youtube.com/watch?v=sN1gwKxZDkY He happens to be a Christian who is not prone to B/S. He has a large following in the US and has many videos with people who have had encounters with Bigfoot. Preferable to watch the whole interview but from 40:19 secs is essential. These views are fast becoming the most accepted in The US. more than anything science can produce. We, in Oz, try to emulate the United States even though we won't admit it so maybe one day our minds will be more open to the American experiences. Sitting on the fence opinion. Political Correctness exists for a reason. A reason that is often forgotten by many people. It was designed to eliminate discrimiation, inequality and racism ( just a few of many reasons ). It was enforced by government and the corporate sector to eliminate legal action for the above reasons and generally to make people feel like they had rights. It also sporned the age of 'entitlement' which is also a curse. People feeling it was 'their right' to have certain things, special needs or whatever you want to call it. Its been indoctrinated into our younger generations and now they feel its their right. In my eyes - the horse had bolted. Now how can you do a rollback on things like discrimination or inequality without causing a division in the community? How can you say to someone " We want our country back? " or " You cant be married because of your gender/partner? "...the list goes on. Who has that ultimate right to say right or wrong....elected officals or the community. Unfortunately its a quagmire and as a community its going to very difficult to reverse because there are millions of people out there who will not tolerate a second class existence to meet those "who have had enough!" Its a vicious circle. ChrisV wrote: Sitting on the fence opinion. Some of your points are correct (IMO), but I also feel you are misreading those who stand against PC. Noone wants to deny people the 'right' to live whatever lifestyle they want. And no one is saying 'we want our country back'... it was never 'ours' to begin with. The issue with PC is it is being used intentionally by the PTB to shut down discussion/debate on a variety of issues and with mainstream media complicity it is used to silence any opposition to 'thier' plans. An excellent example of this is the George Soros-sponsored group AntiFa. This group literally attacks both verbally and physically anyone who disagrees with thier opinion (if you're white you are rascist/NAZI/fascist). They do exactly what they are accusing others of doing in the process. And look how the media presents these thugs... AP called them 'peace activists' FFS!!!!! (After a backlash they withdrew this label). Anyway, this is the wrong thread for this topic so I started a new thread in the 'Off Topic' section of the forum called Where Have The Grownups Gone. I suggest further discussion of this topic should be carried on there. Unfortunately it goes around and around and is a very sensitive issue. I have been watching Paul McLeods Youtube channel Global Monster: Chasing the Grigori which Paul often refers us to when commenting. Just a question Paul, Do You consider Yowies to be Grigori? because if you do you are substantiating my interpretation of what these creatures are along with Bigfoot, Dogman and other cryptids. Paul, I'm sure you know who the Grigori are but to those who don't he is some information. The Lord spoke: "Have no fear, Enoch, good man and scribe of goodness. Come hear my voice. Go speak to the Watchers of Heaven, who have sent you to intercede for them. Tell them, You should intercede for men, and not men for you. Why did you leave lofty, holy Heaven to sleep with women and, to defile yourselves with the daughters of men and take them as your wives, and like the children of the earth to beget sons, in your case giants? Though you were holy and spiritual, living the eternal life, you defile yourself with the blood of women, you begot children with the blood of flesh, and like the others you have lusted after flesh and blood as do those who perish. Because they perish I gave them wives so they might impregnate them, have children, and nothing be lacking on the earth. But you were spiritual and immortal for all generations of the world. So I gave you no wives, for Heaven is your proper dwelling place." In the early days after the Fall, before the demons had escaped from Hell and before the War had begun in earnest, the Seraphim Council debated long and long about how best to safeguard humanity. They knew mankind was imperfect and needed to be taught selflessness and fear of God, yet some angels felt that humanity could only be spiritually enlightened if Heaven controlled their development, with angels overtly ruling over them. Others pointed out that it was God's decree that humanity should be left alone that provoked Lucifer to rebel in the first place. How could Heaven protect mankind and at the same time, refrain from interfering in the Great Experiment? Seemingly in answer, God created the Grigori, the Eight Choir. And the Archangels saw that the Grigori were ideally suited to the task at hand, and dispatched them to Earth, to watch over mankind and report to them what they saw. The Grigori were truly the most "human" of angels. They could blend with humanity, cope with the petty selfishness and daily sins of men without twitching, interact with humans as near-equals, and all the while retain their divinity. The Grigori were the only angels who really understood humans. Even the Mercurians, who loved humans and intuitively understood the intricate web of human relationships, were still removed from mankind, as benevolent teachers keep themselves at once involved and yet detached from their pupils. Even the most benevolent angels know that they are a different order of being than man, holy and celestial and complete, unlike mortals. Only the Grigori understood what it was like to be human. Only the Grigori truly appreciated what made humans special, the reason why God had set them above all other creatures, including angels. The Grigori were also the only angels who really felt comfortable on Earth, and who didn't mind staying there. This ultimately contributed to their downfall. It made them very, very effective at their jobs. They knew why humans did evil, why humans acted selfishly, and they knew how to teach people better, without taking away from their free will. And when the demons came, as Heaven knew they would, the Grigori could sense the slightest disturbance, and thus fulfilled their second function: they warned other angels when demons were about. The Horde learned to fear the Watchers, for while the gentle Grigori were no warriors, even the most subtle diabolical tampering could result in a sudden visit from a flight of Malakim. The demons could never be sure they were safe. I must add that the Grigori also sired the original Children of the Grigori (and their monstrous kin, the Nephilim). It was for the sin of breeding with humans that they were Outcast in the first place. As I have said before the monstrous Nephilim not only bred with human females but also copulated with animals of the land, sea and air creating monstrous beings all of this can be found in ''The Book of Giants'' from the Dead Sea Scrolls. So, in my opinion, it was not the Grigori that was responsible for all these miscegenated hybrid monsters but their offspring the Nephilim. Have you condsidered the 'Esau's descendents' theory? THIS is Sasquatch. For they are NO QUESTION The Stronger. Do not take my Word for it. Ask the Native American. They will tell you of this Nocturnal Nation of People that are of a different MANNER than You or Me. We do not know the Population of these things ? But wouldn’t they be Considered a small group of feral People among the Modern Nations ? And Esau ( sloping forehead people) is a Wild Man of the Field while Jacob ( Modern Humans of ALL COLORS) Was a Dweller of Tents. They have NEVER Been Conquered before. ( so maybe I do not KNOW ? But could One assume an Author from 5000 years ago would not see these Sloping Forehead People as Ruling the Planet ? ….. They have Never Been Conquered. Only Cohabited. Where THESE The Giants the Native American remember ? Who is to say ? Would THIS Be Impossible for GOD to accomplish ? To bring these Sloping Forehead People from the Line of Esau ? And the Modern Human Sapiens from Jacob ? And WHY Would Esau’s Lineage be less liked bye the Lord GOD ? Could it have something to do with these things being Cannibals ? or the fact they do not Track Time as We do ? (and if you do not Track Time? How can one observe the Sabbath?) I do not know ? But I am Guessing ! I am not the Judge. Would THIS Be Impossible for GOD ? And they do have a Aura of the WOOO we have come to understand. Could this explain away the ” Sleeping among the Stars ” ? Does anyone else keep up on the Elongated Skulls from Peru ? And they present a Fetus of a Child with a Skull of Equal size as the Torso. And it had a FULL SET OF TEETH. Do These Sasquatch Bare Children with a full sets of Teeth ? Are they Born already KNOWING what is good to Eat and where to Look To find it ? What else do these Things Remember ? Is this in fact the Sinister reason this is being suppressed ? (KICK THAT HORNETS NEST !)" Interesting theory there Wolf but Jay goes astray after The elder (Esau or Sasquatch according to Jay) will serve the younger Jacob. His theory doesn't account for the other multitude of cryptids out there that we presume exists ....... Dogman. Yowies along with Sasquatch. Esau was indeed born hairy and red but this red may very well mean a ruddy complexion as we see in people born with red hair do sometimes have a ruddy skin tone. Scotsmen for example although this is can be accredited to the Viking lineage - another example. How does he account for the elder (Sasquatch) serving the younger Jacob? Jay asks: And WHY Would Esau’s Lineage be less liked bye the Lord GOD ? Could it have something to do with these things being Cannibals ? or the fact they do not Track Time as We do ? (and if you do not Track Time? How can one observe the Sabbath?) I do not know ? But I am Guessing ! I am not the Judge. Would THIS Be Impossible for GOD ? So, considering the context, God loving Jacob and hating Esau has nothing to do with the human emotions of love and hate. It has everything to do with God choosing one man and his descendants and rejecting another man and his descendants. When Native American legends and myths get mixed up with Biblical scripture things can go awry. I see evangelical Christianity runs strong among the ranks! The Old testament as a guide to the origins of the yowie is only useful if you choose the literal interpretation of the old testament, like fundamentalist Christians do. It appears most people in this thread heartily accept the literal interpretation? I won't be at this point, but if I change my mind and decide to join in and play with a literal interpretation of the old testament, which version of the old testament is everybody here referring to? An allegorical interpretation of the Old testament which I prefer, has nothing to say about the Yowie or other cryptids. Black stated: An allegorical interpretation of the Old testament which I prefer, has nothing to say about the Yowie or other cryptids. Correct Black, no mention of cryptids in the Old or New Testament but some strong clues to their existence. "And as it was in the days of Noah, so shall it be also in the days of the Son of Man." The emergence of the "Nephilim" was what brought about the Flood of Noah. No direct reference to cryptids, enter The Dead Sea Scrolls and the detailed account of the desolation amongst humans and animals caused by the Nephilim. As I've said many times it this abominable activity that brought about the monsters that we now regard as cryptids. These creatures are found on almost every continent on Earth and appear not only to be increasing but showing little restraint in revealing themselves to humans. IMO they are here for a reason and that will be revealed in the future. 8 And I looked, and behold a pale horse: and his name that sat on him was Death, and Hell followed with him. And power was given unto them over the fourth part of the earth, to kill with sword, and with hunger, and with death, and with the beasts of the earth..
An explanation is required. So what beasts of the Earth would be capable of joining the battle to kill a quarter of the Earth's population? only Bigfoot,Yowies Dogman and others certainly not the usual animals we would associate that with i.e Lions, tigers, bears, wolves. as these are reducing in ever-increasing numbers and apart from that they are only found on certain continents. That leaves the beasts that are found everywhere except the Arctic and Antarctic - the cryptids. An explanation is required. So what beasts of the Earth would be capable of joining the battle to kill a quarter of the Earth's population? Invertebrates and insects kill more humans than any other 'beasts' on the planet. 8 And I looked, and behold a pale horse: and his name that sat on him was Death, and Hell followed with him. And power was given unto them over the fourth part of the earth, to kill with sword, and with hunger, and with death, and with the beasts of the earth.[/color]. Shazzoir I think the mozzies and other bugs may be categorised in the and with death section, I've never heard insects being referred to as beasts. The lions , tigers, hippos etc insignificant numbers really and no match for high calibre weaponry. From an allegorical interpretation, the explanation is including beasts into the stories embellished or strengthened the moral component of the stories. As I said, it's only useful to cryptozoology if you buy into a literal interpretation rather than a spiritual interpretation. Are you all part of the same church by some chance? The Bigfoot is more accurately an early model of humans before we became modern humans. They do not exist in the same realm as humans but humans can sometimes peak into that realm and see them, and sometimes they can interact with our realm. You're sounding very paranormal there Black so in that respect we are on the same page. I can go along with the word realm and even throw in another like portals. 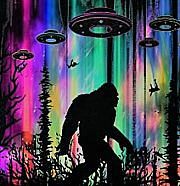 Bigfoot has been seen doing just that on the Sherman Ranch in Utah coming and going through portals and descending from orbs something quite advanced for early humans. But everybody seems to want to bypass the other big elephant in the room my favourite - Dogman also seen numerous times on the Skinwalker Ranch and other states of the US such as Michigan, Ohio, Texas, New York State,Mississippi, Louisianna and now making an appearance in OZ. Reminder to people not everything in the Bible is symbolic as some people seem to think it's being able to differentiate between the symbolic and the factual that's the key. In the book of Enoch chapter 6, we learn that Two hundred of Satan's angels descended to the summit of Mount Hermon. There they pledged their loyalty to Satan to fulfil their goal, which was to destroy God's perfect creation; on the penalty of eternal separation from heaven, which was a mutual biding curse on them all. Once on earth, the angels fell under the control of their new fleshly desires, to fulfil all their earthly lust. They copulated with as many of the earthly women as they chose, and set themselves up as the rulers of all the nations, and had the people working as their servants, and worshipping them as gods. They appeared to the women as handsome men with blue eyes and their hair was the colour of gold; but they also had the ability to shape-shift and change themselves into animals and monstrous beings, to frighten the people into bringing them food, sacrifices, and great riches of gold and precious stones. And all the others together with them took unto themselves wives, and each chose for himself one, and they began to go in unto them and to defile themselves with them, and they taught them charms and enchantments, and the cutting of roots, and made them acquainted with plants. And they became pregnant, and they bare great giants, Who consumed all the acquisitions of men. And when men could no longer sustain them, the giants turned against them and devoured mankind. And they began to sin against birds, and beasts, and reptiles, and fish, and to devour one another's flesh, and drink the blood. Then the earth laid accusation against the lawless ones. And they assumed the positions as Judges and rulers in all the lands, and Mankind quickly learned their angelic names. Under the leadership of twenty captains, they defiled themselves with the daughters of men, to whom they taught charms, conjuring formulas, how to cut roots and the efficacy of plants. The offspring from these marriages was a race of giants, Thirty ells tall (about 45 feet), who consumed the possessions of men, and when they could obtain nothing more from them, the giants turned against the men, devouring many of them, eating their flesh and drinking their blood. The bad angels had already become so desperately wicked, that it was not out of character for them, to commit such sexual atrocities against both mankind and animals, as a means of polluting the bloodlines and destroying God's creation. The fact that Scripture tells us very clearly in Matthew 24:37, “It will be as it was in the days of Noah,” should awaken us to understand the unthinkable is evadable. Because it literally tells us the Demonic Nephilim (Rephaim) will be roaming the earth once again! I know I have been on about the Nephilim for an awfully long time and I have no doubt that the creatures we see today as cryptids Bigfoot/Sasquatch/Yowies, as well as Dogman and others, have been with us for a long time and we are now becoming seriously introduced to them. Sorry about the red print that wasn't supposed to happen. The below image is of Mount Hermon. Fallen angels with the ability to shapeshift into animals and monstrous beings. Giants up to 45 foot high with the same capabilities. Bigfoot reports of up to 14 foot tall and Dogman even bigger up to 20 Ft. Does anybody not see a strong connection here? As the Bible tells us there are demons roaming the Earth and Mathew 24:37 tells us they are here with us today.